Where you come from isn’t who you are. 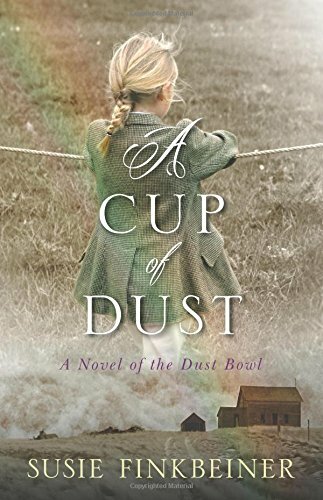 Ten-year-old Pearl Spence is a daydreamer, playing make-believe to escape life in Oklahoma’s Dust Bowl in 1935. The Spences have their share of misfortune, but as the sheriff’s family, they’ve got more than most in this dry, desolate place. They’re who the town turns to when there’s a crisis or a need–and during these desperate times, there are plenty of both, even if half the town stands empty as people have packed up and moved on. Then a mysterious man bent on revenge tramps into her town of Red River. Eddie is dangerous and he seems fixated on Pearl. When he reveals why he’s really there and shares a shocking secret involving the whole town, dust won’t be the only thing darkening Pearl’s world. While the tone is suspenseful and often poignant, the subtle humor of Pearl’s voice keeps A Cup of Dust from becoming heavy-handed. Finkbeiner deftly paints a story of a family unit coming together despite fractures of distress threatening to pull them apart. I found this book to be a good historical fiction novel. It seemed to a relatively accurate description of how it may have been in the Dust Bowl. The story is a little dramatic, but the drama does make the book a bit more interesting. If you enjoy historical fiction, this is probably a good book for you.